ExpressVPN have one of the largest worldwide networks with the biggest range of supported devices. Mobile apps for Android & iOS. VPN servers in nearly 100 countries. Huge 30-day money back guarantee. ExpressVPN is one of the oldest and most popular VPN services trusted by hundreds of thousands of users worldwide. But do ExpressVPN deserve this reputation? We tested ExpressVPN in both 2016 and 2017 and found them to offer a robust, stable and quality service. Is this still the case though? We wanted to find out so we’ve been putting the service through its paces to bring you this 2018 review. Find out what we found. ExpressVPN is like most VPN services, there are no different packages available just one standard one that varies in subscription length. Like other VPN services, it’s considerably cheaper if signing up for 1-year over paying on a monthly basis. The service is slightly more expensive than many comparable options out there but they do have considerably more server locations than most so in that regard the higher price tag is mitigated against. No matter how long you subscribe to ExpressVPN for, every subscription length has access to the same VPN protocols. ExpressVPN offer PPTP, L2TP, SSTP and OpenVPN protocols on the service. SSTP is a nice addition as it’s not always on offer from every provider. ExpressVPN is a “No-Log” VPN provider. But what does that actually mean? Many VPN services claim to store no logs. While they may not record what you do on the service they often record metadata. For example what time you connected, which server you connected to and what IP you were assigned. ExpressVPN claims not to store any of this which means they store no-logs of your activity or any metadata logs. They do however record what apps you use, the dates you used the service but not times and the server locations you use. Unlike many other providers, ExpressVPN is a service that has had their no-logging policy put to the test in an extremely high-profile case relating to the assassination of a Russian diplomat in Turkey, you can read more about that here. Server locations are one area where ExpressVPN excel. There are VPN access points in more than 94 countries across the world. It’s worth pointing out that ExpressVPN uses a combination of physical VPN servers and virtual locations. Virtual Locations are VPN connection points that report being in one country but are in fact in another. This has in the past been considered “cheating” to boost claimed server numbers but ExpressVPN is one of few who rectified this and are honest about which VPN servers are physical and which are virtual. You should definitely check out their website to ensure you’re connecting to the correct server type for your needs. Connection points are available in over 148 cities and there are more than 1700 VPN servers in total across the network. There are currently a total of 68 countries with physical VPN servers and 29 virtual locations. ExpressVPN sadly has one of the lowest limits when it comes to concurrent connections. You’re allowed to use the service on up to 3-devices at the same time. While it is one of the lowest limits in the industry with most allowing 5-6 these days in all honesty it probably is enough for most users. In our tests we very rarely use any service on more than 2 devices at the same time so while it is on the low end of the scale it’ll probably be enough for 90% of users. One of the best features of ExpressVPN is they have a huge 30-day money back guarantee that lets you test the service for an entire month. If you’re unhappy you can simply get a full refund. Alongside the Android, iOS, Windows and Mac apps there’s also a Linux client which is a rarity in the VPN industry. If you’re an Ubuntu user then you’ll be able to make connection simply using the dedicated Linux client. Their most recent release is an app for Amazon devices, namely the Fire TV and Firestick. This is great for protecting your viewing habits and if you have Kodi installed on either device you’ll surely love this development. There is also dedicated support for routers and ExpressVPN is one provider who offers an app for select routers. It’s also possible to purchase a range of routers with the ExpressVPN service pre-installed. If you want to bypass the restrictive 3-device limit then a dedicated router is definitely the way to go. If you run into issues when using the service or you’re new to VPN use then the 24-hour, 7-day per week live chat is a great feature of the service. Live chat isn’t available from all providers so if you’re likely to need it then you’ll surely appreciate someone being on hand to help. Mobile apps are available for both Android and iOS devices. They’re not necessarily the most visually appealing apps we’ve seen but they are functional. 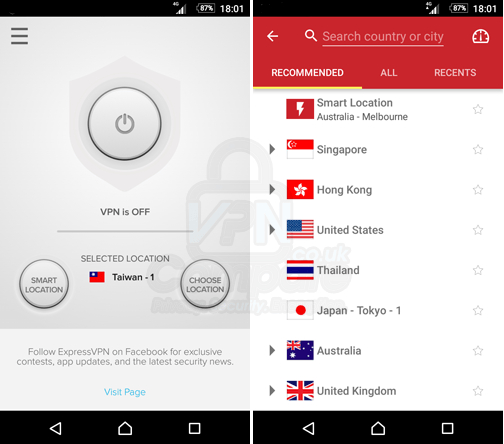 There are limited features available on the ExpressVPN mobile apps and instead they concentrate solely on getting you connected without bogging down the app. Connection is possible incredibly quickly just by pressing the connection button on the main app screen. You can also use the Smart Location function which chooses the best server for your situation. If you need more customisation over your connection location then individual locations can be selected by recommendation, country or by recently accessed servers. There’s also the option to speed test every server to find the fastest in your location. Visually the ExpressVPN desktop apps available for both Windows and MacOS haven’t changed in the past year. However, one nice feature is it looks almost identical to its mobile counterpart. Some providers have completely different interfaces over different device types which can make it hard if you’re a beginner. 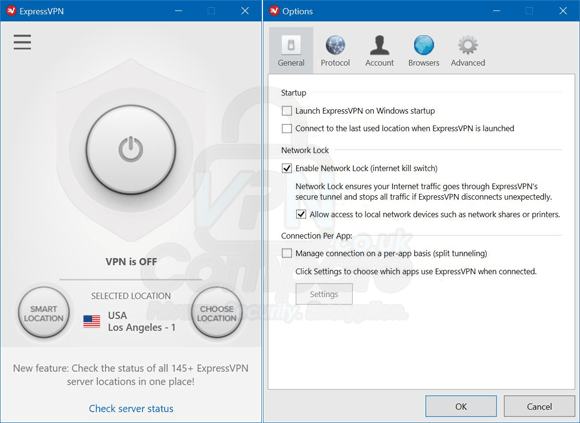 The ExpressVPN desktop app allows you to seamlessly use it between both computer and mobile device because it functions the same. The main window has a small footprint so if you’re using a smaller screen such as a laptop then you’ll appreciate its space saving appearance. From the main screen you can connect to your previously selected location in just one-click or let the app do the deciding for you and use the “Smart Location” feature. Hidden behind the “burger” icon are the settings and inner workings of the app. Here you can choose server locations, get help, do diagnostics or access the Advanced Options. The desktop app is feature rich and allows you to make use of a Kill Switch, IPv6 Leak Protection and make use of ExpressVPN’s own secure DNS Servers. You can also choose your VPN protocol and set-up available browser-extensions if required. One of the most interesting features is the “Split Tunnelling” that allows you to select specific applications to make use of the ExpressVPN connection while others fall outside it. If you wanted to encrypt your whole connection but have for example a specific game not make use of the VPN connection then this is entirely possible. We haven’t seen this feature available from many other providers so it’s definitely a unique addition. We found speeds on the ExpressVPN service to be generally good. They’re certainly not the fastest VPN service in the industry, nor are they the slowest. For everyday use we noticed no slowdowns or interruptions that would affect your day-to-day use. We were able to stream videos, access websites and download files all without issue. So our connection suffered over a 10 Mbps loss in speed and while they’re not the best results speed wise they’re also not half bad either. We’ve seen worse from other providers. ExpressVPN is never going to be a service to write home about blisteringly fast speeds. However their speeds are reliable and mostly consistent allowing you to use the VPN service without much noticeable impact on your day-to-day use. ExpressVPN offers access to one of the larger range of VPN protocols. PPTP isn’t much use for anything apart from over-coming geo-blocks but with L2TP, SSTP and OpenVPN you have a good choice of connection types. OpenVPN which is by far the most common and secure VPN protocol for you to use uses AES-256-CBC encryption. It’s the same as last year but is still the industry standard and is for all intents and purposes a high-level encryption mode. ExpressVPN on their website claims to use a 4096-bit RSA key for handshaking. This basically means for authentication when you connect to a server. Despite calling this out to be untrue last year, it appears to still be the case this year. While the ExpressVPN website claims to be using 4096-bit RSA keys, it’s actually a 2048 bit RSA key, at least on the servers we tested. What apps and app versions you have used. What days you connected to the service, but not times. Which VPN server you connected to but not what IP Address you were assigned. What country you’re from and ISP but not IP Address. They claim to store this information to help troubleshoot when issues arise. We are of the opinion that the data that ExpressVPN does store is minimal and would be impossible to link you to your actions from. It’s reassuring to see ExpressVPN be honest about this and as was discussed earlier in this review this has been tested in a recent case. ExpressVPN isn’t the cheapest VPN provider available but they do have a lot going for them for their slightly higher price tag. Right off the bat they’re based in the British Virgin Islands which puts them outside the group of spying countries known as Five-Eyes. It also means they have no requirements on data-retention. In a nutshell, the laws of the BVI don’t require them to log information on you. ExpressVPN do retain minor logs but none of this information can identify you, it is mainly for troubleshooting purposes. Unlike many VPN providers the ExpressVPN no-log guarantee has been put to the test in an extremely high profile case which should alleviate any fears you have. Speeds aren’t the fastest on the service, nor are they the slowest and they’re comparable to many other providers out there. While you won’t be writing home to tell anyone how fast their speeds are, you also won’t be complaining about any issues either. Apps are available for Android and iOS devices and software for Windows and Mac computers. They also recently released a dedicated Amazon Firestick app which allows you to protect your viewing habits – great if you use the Firestick device with Kodi. On top of that there’s a Linux client for Ubuntu and the best range of router apps we’ve seen. ExpressVPN offers a good all round service. Connections are robust and reliable and with VPN connection points in over 94 countries, they offer one of the biggest choices in the industry. It’s certainly not a perfect VPN service, but none are. However it is one of the best out there and with a 30-day money back guarantee you’ve got plenty of time to test it risk-free to see if it’s suitable for you. If ExpressVPN isn’t for you, check out what our top-rated VPN service IPVanish has to offer in our 2018 review.